It wasn’t supposed to happen this way. The stage was set for top-ranked American Andy Roddick to sweep the Legg Mason Tennis Classic for the fourth time on the Washington, D.C.-based tournament’s 40th anniversary. The tournament took place at the same time as the 2008 Beijing Summer Olympics, so Roddick—ranked ninth in the world—was the only top-10 player present. After a sloppy first round against Paraguay’s Ramon Delgado, a qualifier, Roddick was given a clear path to the final when all the seeded players in his bracket were eliminated. But he struggled against 56th-ranked Eduardo Schwank in three sets, having to save two match points in the second. By the time he reached the quarterfinals, Roddick quietly succumbed to Viktor Troicki—a player barely cracking the top 100—in three sets. As Roddick’s game cooled down, then 19th-ranked Juan Martin Del Potro’s game was heating up. The 19-year-old Argentinean’s star has been steadily rising over the past couple of years. In 2005, he was the youngest player in the top 200; in 2006, he was the youngest in the top 100. This year, he has cracked the top 20. 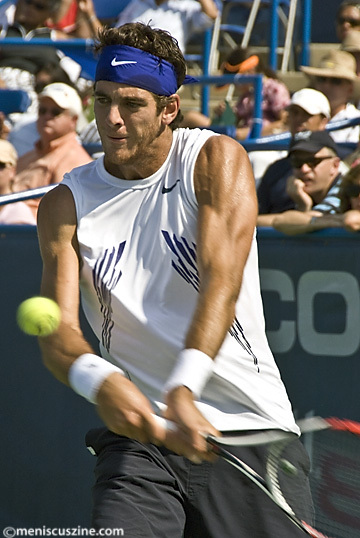 His 18-match winning streak coming into the Legg Mason was second only to Nadal’s 32 for 2008, and included three straight ATP titles at Stuttgart, Kitzbühel and Los Angeles, where Del Potro took down Roddick in straight sets. “Now I have a lot of experience playing finals,” Del Potro said before he played at the Legg Mason. Unlike Roddick, Del Potro dominated Troicki in straight sets, 6-3 6-3. He won 71 out of 127 total points played – 81 percent of his first serves and 45 percent of his second serves. As impressive as Del Potro’s rise is, he hasn’t developed a complete game. He suffers from a weak backhand; in his last three matches in D.C., only a quarter of his winners came from that side. Towering at 6’6”, he prefers to hover behind the baseline. While his height gives him a 120 mile-per-hour serve, he can only get it in barely over half the time. With a slightly unreliable second serve, Del Potro has a weakness for double faults. He had seven in the final, and served up back-to-back doubles to go down a break in the first set. However, many analysts see Del Potro’s meteoric rise as a sign of bigger things to come. After Del Potro won in D.C., former tennis star Brad Gilbert boldly predicted that the Argentine could be crack the top 5 by next year. And during the 2008 U.S. Open—where Del Potro made a career-best quarterfinals appearance, losing to eventual runner-up Andy Murray in four sets—John McEnroe had nothing but praise for the young player. “This guy is the real deal,” McEnroe said.